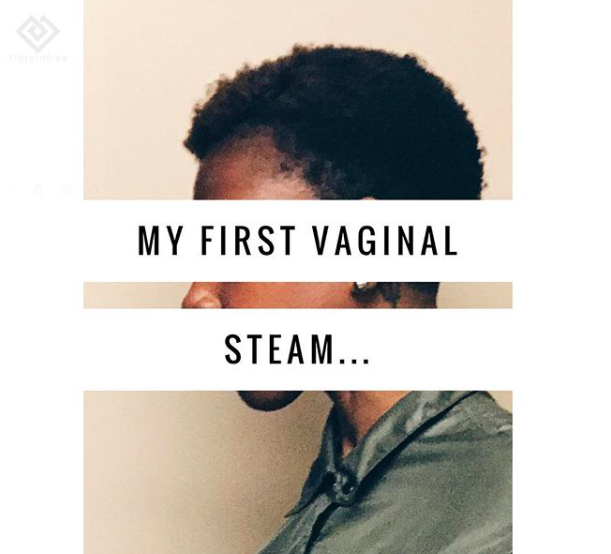 Two weeks ago I had my first vaginal steam. It felt like it was something I was supposed to know how to do but somehow I didn’t. I didnt know if I was supposed to squat and manually open myself up for it or what…… so I didn’t and I felt like I was sitting on a tea pot. Think of the light steam that comes from a simmering tea kettle. As you enter the space, there is a smallish wooden box with a burner and pot inside. A pot pot, like something you would see in a kitchen. And a lid on top of the box with a hole in it. Thankfully she had a cushion donut ring to sit on to save (rest) your behind, because otherwise you’d be sitting directly on the wood and while you can wipe it off, I would have had questions on the sanitary conditions, had there not been a barrier of some kind. Also I was thankful for the ring because you are sitting there for a good thirty minutes. She sets the temperature, she already put in the herbs and then you put on a towel wrap. And just sit. Chat it up with friends or spend time meditating on what your doing. Thankfully I had a friend there to sit with me and we just chatted. About newlywed life. The timer went off and that was it. Put your clothes back on and jet. The Pros: What I will say from the experience was that during my last period I felt like I was hemorrhaging or something. The blood was so dark and so urgent I don’t know it just felt like I must’ve cut something in my uterus and a vein was being let. It was awful and very bloody. But September’s period, while there were more days, it was much lighter. The Cons: It was $50 so I can’t afford to be doing this thing weekly. And the woman I went to used herbs from Steamychick.com and she basically said I should buy my own herbs from there and get my own set up because for fibroids you essentially have to steam every day until your period starts and then go down for the week of your period and then start back up. Which is an investment ($$) not terribly expensive, less than $300 all in, but just something that I don’t know if I’m ready for yet. The Rub: I know someone that this is worked for (shrinking her fibroids) so maybe I should do it? Still trying to figure this thing out. What do you think? Should I try again? Invest in my own set up?